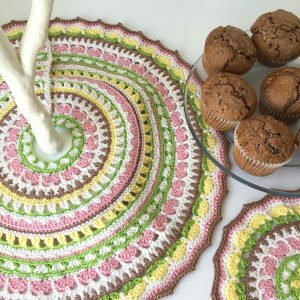 I’m excited to launch something very different today – a crochet pattern for a tree skirt and matching mandala! 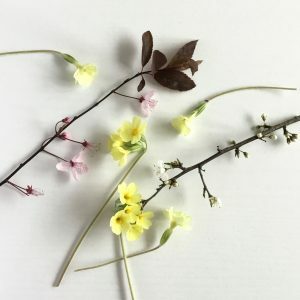 These days a lot of us use a twig tree to decorate throughout the year – it’s a lovely way to reflect the changing seasons. It occurred to me that whilst I have lots of decorations to fill the branches of my tree, the base was a little, well, boring – a missed opportunity! Several years ago, I made a ‘tree skirt’ that covers the bucket our Christmas tree goes in (and helps a little with needle pick-up). 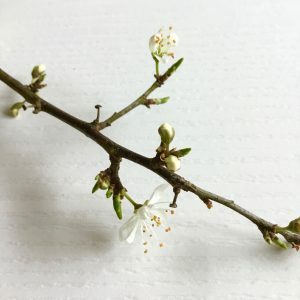 I decided my twig tree needed the same treatment, especially since, unlike the Christmas tree, the twig tree sits on a table and its base is more visible. 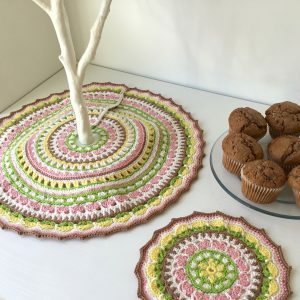 Many of us love making crochet mandalas, so I took that idea and make a circular design with a split that allows you to place it around the ‘trunk’ of your tree without needing to remove the trunk from the base. 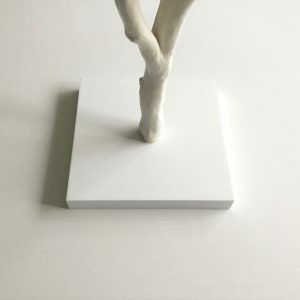 The split also makes it possible to arrange the skirt smoothly whether it is in a flat circle or in more of a cone shape if your twig tree base is raised. Let me tell you, this has involved a lot of maths! 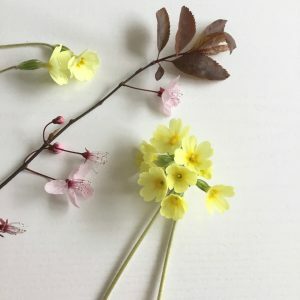 The colours and motifs are inspired by the primroses, and blackthorn and cherry blossom that are surrounding us in the south of England at the moment. 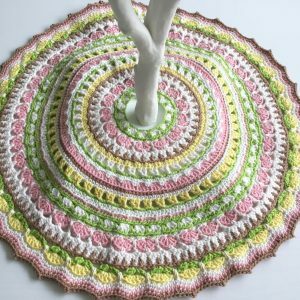 The finished tree skirt measures 45cm/18inches and has a 5cm/2inch hole at the centre to accommodate the ‘trunk’ of the tree. 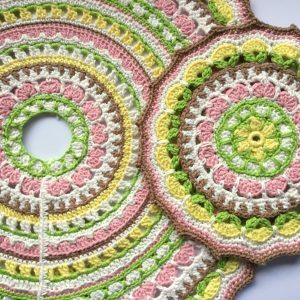 To complete the set, I have designed a matching 20cm/8inch mandala which sits perfectly under a vase or plate. 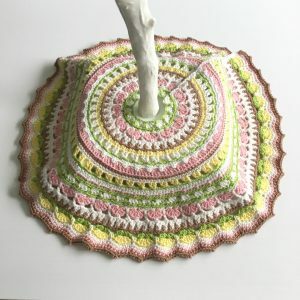 I used Paintbox Yarns Cotton DK for my example and 6 balls (two of white, one each of the other four colours) is sufficient to make the tree skirt and mandala. 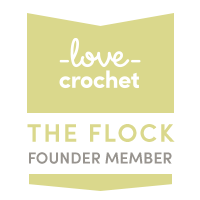 Click here to see the yarn on LoveCrochet. 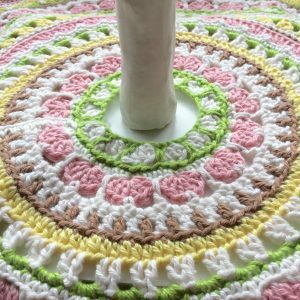 Don’t forget to share pictures of anything you make from my patterns with the hashtag #LittleConkers on Twitter, Facebook and Pinterest. 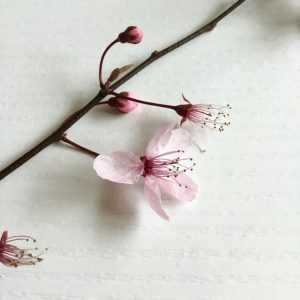 I’m also now on Instagram – in the sense that I now have an account. I have no clue what I’m doing so please do look up at @LittleConkersUK and give me a helping hand although it takes me a while to reply to posts and comments!